Stay ON the beach in Netarts Oregon! 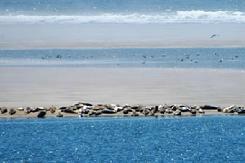 Luxury Vacation Rentals on the Beach in Spectacular Netarts, Oregon!! All season fun for all. Every reason you chose the <?xml:namespace prefix = st1 ns = "urn:schemas-microsoft-com:office:smarttags" />Oregon Coast is found here. We have three homes on the beach and one overlooking Netarts Bay. Enjoy the ever-changing and breathtaking waterfront 180-degree views of the Pacific Ocean, Cape Lookout and Netarts Bay. Enjoy long walks on the sandy beach, fly a kite, or watch the seals and sea lions play in the surf and bay. For more adventure go crabbing, fishing, kayaking, hiking and more. Or perhaps you would rather relax inside by the fire and watch the day drift by while reading, napping, playing games, or just resting on our private waterfront deck. Crank open the many beachside windows and indulge in the delightfully moderate prime season climate (March through October). In the off-season (November through February) snuggle up by our stone fireplaces as you awe at the pounding surf and winter storms. Watch the high tides move within 25 feet of our homes and enjoy the fresh smell of the Ocean's mist! Please call for last minute specials! !